Zug der verbündeten Europäer und Asiaten nach Ostindien. Mit einer Charte. 2 volumes. 264 pages with frontispiece; 272 pages. Octavo (8 3/4" x 5 3/4") bound in original publisher's full leather with gilt stamping on spine with black label lettered in gilt. Edited by Peter Pratt. (Whyld and Ravilious 1808: 10)Francois-Andre Danican Philidor was born on September 7, 1726 in Dreux, France. His father Andre (1647-1730) was the keeper of the music for King Louis XIII of France. In 1725, Andre introduced the public concert. Andre had 20 children and was 79 when Francois-Andre was born. Francois was the last child of Andre and the first son of his third wife. Andre's third wife was in her 20s. In 1731 at the age of six, Francois-Andre entered the choir of the Chapel-Royal in Versailles. As a pageboy in the royal chapel, he studied music with Andre Campra. Philidor's father had died earlier and was living on a royal pension. The young Philidor was recognized as a musical prodigy among the 80 musicians. In 1736 at the age of 10, Francois-Andre was exposed to chess by the musicians who played chess during spells of inactivity. Cards were forbidden to pass the time, so chess was played. He learned the game by watching the band members play. He later visited the Cafe de la Regence in Paris and spent much of his time playing chess there. In 1737, at the age of 11, his first music composition, a religious piece, was played before King Louis XV. He left the Chapel Royal choir in 1740 when his voice changed. In 1740 he went to Paris where he earned a living by copying music and giving music lessons. In 1741 Philidor was being instructed by M. de Kermur, Sire de Legal (1702-1792), the leading French chess player. Legal initially gave Philidor rook odds. For the next three years Kermur taught Philidor until Philidor was too strong for his teacher. In 1744 Philidor played two chess games blindfolded simultaneously in public in Paris. He said he had learned how to do this when he could not sleep at night and played chess without sight of a board. This was the first time blindfold play against 2 opponents was recorded. This performance was chronicled in the article on chess by the Chevalier de Jaucourt for the great Encyclopedie of Diderot and D'Alembert in 1751. Philidor played chess with Voltaire and Jean-Jacques Rousseau, both persistent but weak chess players. In December, 1745, Philidor went to Rotterdam to assist in presenting concerts with Geminiani and Lanza. The musical tour involved a 13-year old girl who played the harpsichord. However, she died during the concert tour. Later, the concerts were canceled because of the girl's death and he was stranded in the Netherlands with no money. He supported himself by teaching and playing chess and Polish draughts (10 by 10 checker board), especially to English army officers at The Hague. The English officers suggested that Philidor could make a living playing chess in England. In 1747 he went to London and started playing chess at Slaughter's coffee-house. There, he beat Phillip Stamma and Sir Abraham Janssen (1720-1795), two of England's top chess players, in chess matches. Philidor challenged Stamma to a 10-game match and he stipulated that Stamma was to have White in all games and that draws were counted victories for Stamma. Philidor won 8 games, lost 1, and drew 1. He also beat Janssen with 4 wins and 1 loss. From that time on, Philidor was the unofficial champion of the world. In 1748 Philidor, age 22, returned to Holland and wrote l'analyse du jeu des Eschecs (Analysis of the Game of Chess). Philidor went out to find subscribers for the book before it was published to pay for publishing costs. Lord Sandwich subscribed to 10 copies. The Duke of Cumberland subscribed to 50 copies. The English army officers subscribed to 119 copies. The moves were written out as full sentences. In 1749 433 copies of his Analysis of Chess were published in London. Two more reprints occurred in 1749 and an English version followed in 1750. The book was the first chess book translated into Russian (1824) and was one of the favorite books of Thomas Jefferson. The book analyzed 4 games and 10 variations of games. Philidor favored the Bishop's Opening and frowned upon the King's Knight Opening as weak. The book has gone through more than 100 editions, 4 in the first year. Philidor's chess books was the first chess book that organized the openings, that explained the middlegame, the overall strategy of chess, and the importance of pawn formation. In his book he made the observation that 'Les pions sont l'ame du jeu' (the pawns are the life of the game). This phrase has become "the pawns are the soul of chess." His book was also the first to examine the R+B vs. R endgame. It also had some analysis of 1.e4 e5 2.Nf3 d6, the Philidor's Defense. By 1750 Philidor was considered the strongest player in France, England, and the Netherlands. The French Ambassador, the Duke of Mirepoix, invited Philidor for his weekly chess dinners. In 1751 Philidor left England for Prussia, playing before King Frederick (Frederick the Great) at Potsdam. He then visited Berlin where he played 3 blindfold games simultaneously, winning them all. He then returned to England. In November 1754 he returned to France after being gone for 9 years. He started composing music again. He did not return to England until 1772. He applied unsuccessfully for the post of court composer at Versailles. A rumor had started that nobody could be a chess master and compose good music, so his church music was not really his own. His church music was not accepted by the French royalty because Philidor added an Italian influence to it, so he turned to comedy opera. In 1755 he beat Legal in a chess match at the Cafe de la Regence. On February 13, 1760, at age 33, he married Angelique Richer (1736-1809). He had 5 sons and 2 daughters with her. Condition:Old recasing nicely done, spine ends chipped, corners bumped and rubbed, some pencil notations through out. Over all about a very good copy. Geschichte Schlesiens. Hier 3 Bände in einem Buch komplett ! Band 1. Welcher die Geschichte von den ältesten Zeiten bis 1526 begreift. / 2. welcher die Geschichte von 1526 bis 1740 begreift. / 3. welcher die Geschichte von 1740 bis auf unsere Zeiten enthält. PANDETTE FRANCESI ossia raccolta compiuta di tutte le leggi in vigore, che contiene i Codici Civile, Criminale, Giudiciario, di Commercio, di Marina ecc. Plantes de la France. 4 Bände.Mit 400 farbig gedruckten Punktierkupfern (eigentlich 399 - es fehlt die Tafel `Saponaire officinale` in Bd. 4 (dafür ist Taf.&#145; Chambreule commune&#145; doppelt vorhanden, zus. 400 Tafeln). A PRESENT FOR A LITTLE GIRL. A PRESENT FOR A LITTLE BOY. INSTRUCTIVE HINTS, IN EASY LESSONS FOR CHILDREN. London, printed by and for Darton and Harvey, Gracechurch Street, 1808.. 3 works bound in one, No.1 complete, No.2 lacking 4 leaves, and No.3 lacking 1 leaf. 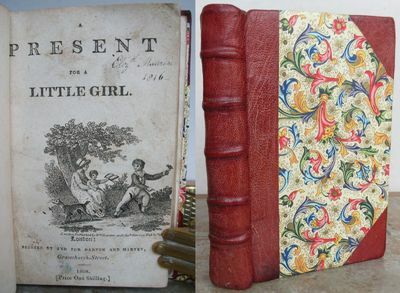 A PRESENT FOR A LITTLE GIRL, early reprint 1808, 12mo, 150 x 88 mm, 5 7/8 x 3 3/8 inches, (52) pages, final 1Â½ pages contain adverts. Engraved title page vignette of mother reading to little girl under tree, little boy pointing to nest of baby birds, 3 full page engravings and 24 delightful half page, some of children at play, some of naughty children. A series of little essays and verses on many topics, some instructive, some extolling virtue. This edition reprints the text of the 1806 edition but most of the engravings have been redrawn. A few are dated 1806 or 1808. Lacks original covers, rebound in modern red half calf with patterned sides, raised bands, no lettering or label, inner hinges strengthened with binder's linen tape. Title page slightly dusty and with 4 tiny ink marks, faint name and date 1816 in margin, tip of upper corner missing on title and following leaf, occasional pale fingermarks to contents, short closed tear to text on 1 page, neatly repaired, no loss, some margins trimmed close, no loss of text. A good plus copy. First published in 1797 with different illustrations. The Dartons, G227(9); Oppenheimer 2090; National Book League 522a; Osborne I,114 (1806 edition). Bound with A PRESENT FOR A LITTLE BOY, London, Darton and Harvey, circa 1806-1808, several images dated 1806. 40 OF 48 PAGES, 4 LEAVES MISSING: TITLE LEAF, FIRST LEAF OF TEXT (A2) AND LAST 2 LEAVES (D5-D6). 22 of 25 engravings including 2 full page, 3 missing on missing leaves. A companion to the title above, first published in 1798. It consists of a series of anecdotes mainly about animals including one on a pig that was taught to read and spell. LACKING ORIGINAL WRAPS, light soiling throughout, 1 page torn across and expertly repaired, some margins trimmed, 1 page with loss of 2 letters, easily legible, another with old paper repair to small closed tear, no loss. An early previous owner has handwritten a title page and on verso the first page of text for the first story. A defective copy of a scarce book. The Dartons, G226(8); Oppenheimer 2087 (edition of 1805); Osborne II,703 (1804); National Book League No. 525 (1805). Also bound with INSTRUCTIVE HINTS IN EASY LESSONS FOR CHILDREN in 2 parts, (by Elizabeth Heyrick), London, Darton and Harvey, No. 55 Gracechurch Street, 1806. Pages: Part 1, 52 of 54 (lacking page 25/26); Part II, 48. Collation: A-B12 (-B1), C3, B2 signed A2; A-B12. Lacks 1 leaf of adverts at the end of Part I. Each title page has a different engraving, in Part II dated 1804, plus 22 charming half page engravings in each Part. Topics include reading, the production of paper and books; animals especially horses (the missing page deals with their cruel treatment), donkeys, dogs, sheep, whales, and their uses; bee-keeping (2 images); knitting and sewing; beauty of sunrise; kindness to animals; pleasures and use of swimming; tasks for a girl of 12; the virtues of cleanliness. Lacking original wraps. Part I: neat small signature and address on first title page, same name pencilled in 1 upper margin within, a few pages slightly dusty, occasional light soiling mainly to margins, A11 is missing lower inner corner with loss of 4 or 5 words on recto and verso, 5 ink squiggles in central margin of A11v, some margins slightly trimmed, no loss, B12 torn across and neatly mended, easily legible. Part II: the same signature on title page dated 1809, a little brown staining to text on A2r, no loss, some pages dusty and lightly soiled, all legible. A good plus copy of a scarce interesting children's book (lacking 1 leaf), first published in 1800. 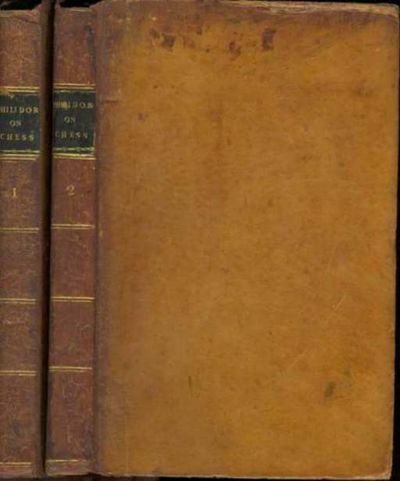 The Dartons, G459(5); a copy of Part I 1806 in the Opie Collection; a copy of Part II 1804 in the V. & A., Osborne I,124 lists only Part II of the 1806 edition. MORE IMAGES ATTACHED TO THIS LISTING, ALL ZOOMABLE, FURTHER IMAGES ON REQUEST. POSTAGE AT COST. Sefer megine 'erets: Shulhan "arukh 'orah hayim ...("im) Magen David...Magen Avraham..."Ateret zekenim...Be'er ha-golah; hosafnu ba-zeh sefer Dagul me-Revavah...Hok Ya"akov...Pri hadash ve-'Even ha-"ozer. Minne af von Linné, fader och son [Memoirs of Linnaeus, father and son]. I-II. \"Ehrenpforte den mit Ruhm aus dem Felde wiederkehrenden Königl: Baier: Truppen errichtet von der K:B. Stadt Augsburg bei dem Einzuge Derselben den 1. Januar 1808\". Die Truppen zu Fuß und zu Pferde ziehen durch einen mächtigen Triumphbogen (Aufschrift \"So ehrt Augusta die Helden des Vaterlands\"), gefeiert von zahlreichen Zuschauern, in die Stadt ein. La topographie de Paris ou plan détaillé de la ville de Paris et de ses Faubourgs. chez l'Auteur, rue de Tournon,, A Paris, 1808 - Cm. 20,5, pp. vii (1) 104 + 22 tavole fuori testo a doppia pagina, fra cui frontespizio, "plan d'assemblage" e 20 tavole topografiche incise da Perrier. Legatura coeva in cartoncino colorato con dorso rinforzato. Esemplare con pochi segni d'uso esterni, genuino e stampato su carta forte. Opera dettagliatissima che fornisce una gran quantità di informazioni sull'ubicazione di vie, mercati, hotel, giardini, fontane. Interessante testimonianza topografica della Parigi pre-Haussman. Raro e ricercato. The Morbid Anatomy of the Human Eye. Illustrated by coloured plates. Second edition. Second edition. The first book on the pathology of the eye, illustrated with some exquisite hand-coloured plates. This edition has three more plates than the first of 1808-18, but the text is unaltered, as there had been no additions to the knowledge of the subject in the intervening years.? ?Wardrop was the first to classify the various inflammations of the eye according to the structure attacked? (Chance, p. 72). Inspired by the pathological anatomy of Bichat, Wardrop?s topographical description of ocular disease earned him the title ?the first modern ophthalmologist? from Duke-Elder? (Becker).See G&M 5840; Becker catalogue 400; Gorin pp. 62 and 120; and Albert, Norton & Hurtes 2430.2 volumes, 8vo, 4 leaves, pp. (v)-xxxi, 175; (viii), 290, 1 leaf, and 18 fine stipple-engraved plates (16 hand-coloured). Half-titles. Original green cloth-backed boards, uncut edges. Some light foxing in vol. 2, corners slightly worn, otherwise a very good, clean set. Natural history of birds, fish, insects and reptiles. Embellished with upwards of two hundred engravings. In six volumes (1808). London, Knight and Compton, 1808. - VII, 332; VII, 332; VIII, 320; VIII, 322; VII; 386 S. Das Exemplar in zwei unterschiedlichen Einbänden. Bände 1 bis 3: Neuere blaue Halblederbände mit goldgeprägten Rückentiteln; Buchdeckel mit mehrfarbigen Marmorbezügen und Lederecken; marmorierter Buchschnitt. Bände 4 bis 6: Braune Halblederbände der Zeit mit goldgeprägten Rückentiteln auf rotem Rückenschild; Buchdeckel mit ebensolchen Marmorbezügen wie die Bände 1 bis 3, ebenfalls mit Lederecken; marmorierter Buchschnitt. Spezielles Werk des Naturforschers Georges-Louis Leclerc de Buffon (1707 - 1788) zur Naturgeschichte der Vögel, Fische, Insekten und Reptilien. Mit 50 ganzseitigen Kupferstich-Tafeln, die jeweils zwei Tierdarstellungen enthalten. Durch seine reich illustrierte Allgemeine Naturgeschichte (Histoire naturelle générale et particuli?re), von zu seinen Lebzeiten 36 Bände, nach seinem Tode weitere 8 Bände erschienen, erwarb sich Buffon internationale wissenschaftliche Anerkennung und avancierte zum einflußreichsten französischen Naturforscher des 18. Jahrhunderts. Bände 1 bis 3 in tadellosem Zustand. Bände 4 bis 6 etwas berieben, sonst gleichfalls gute Exemplare. Erste Seiten der Bände sowie wenige Innenseiten etwas fleckig bzw. gebräunt, Seiten sonst überwiegend sauber und nahezu fleckenfrei. Alle Kupferstich-Tafeln vorhanden. In toto gutes Exemplar des seltenen, reich illustrierten Werkes. Weitere Fotos auf der Homepage des Antiquariats (bitte Art.-Nr. auf der Angebotsseite in das Suchfeld eingeben). Geschichte der Belagerung von Breslau, vom 6ten December 1806 bis zum 7ten Januar 1807. Ein Anhang zur topographischen Chronik von Breslau. Mit vier Kupfern. Richmond, 1808. 16mo. Contemporary calf, leather label. Edges scuffed. Ownership signature on titlepage carelessly obliterated, but not egregious. Overall good and quite clean. A letter laid into this copy from legendary Americana dealer Ernest Wessen and dated 1959, states that he had never handled a copy of this work before the one at hand. Published the same year that Wirt, then future United States attorney general, was elected to the House of Delegates. 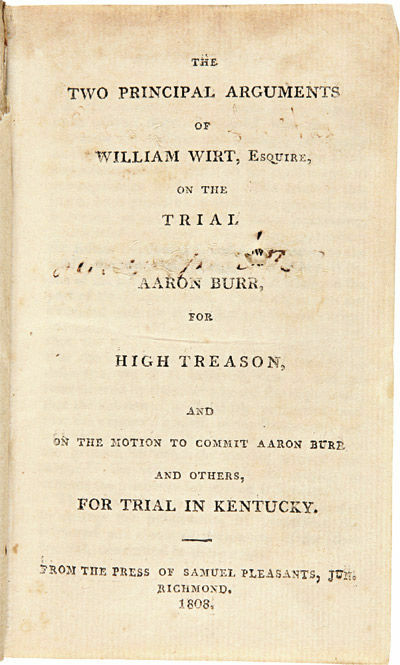 His prestige was increased dramatically when he appeared for the prosecution of the case against Burr, prompting Jefferson to suggest Wirt seek a Congressional seat, which the latter declined. A rare Burr item. Streeter's copy contained a frontispiece portrait which is not always present, and is not present in this copy. HOWES W587. SABIN 104883. TOMPKINS 112. STREETER SALE 1693. SHAW & SHOEMAKER 16753. Planches de l\'Iconographie Grecque. Planches de l\'Iconographie Romaine. 2 vols. Autograph letter signed "Dco Donzelli" to an unidentified male correspondent, his "very dear friend." - Donzelli "made his début at Bergamo in 1808 in Mayr's Elisa. He then completed his studies in Naples with Viganoni and Gaetano Crivelli. For the next decade he sang florid tenor roles throughout Italy, appearing in Rossini's Tancredi, the first performance of Torvaldo e Dorliska (1815, Rome), L'inganno felice and La Cenerentola. Then his voice began to grow heavier, and he turned to a different repertory. In 1825 he made his Paris début at the Théâtre Italien in the title role of Rossini's Otello. During six seasons in Paris he sang in the first performances of Rossini's Il viaggio a Reims (1825), Halévy's Clari (1829) and Bertin's Fausto (1831). He sang from 1829 at the King's Theatre, taking part in the first London performances of Bellini's Il pirata (1830) and La straniera (1832). He created Pollione in Norma at La Scala (1831), and later sang the role in London, Venice, Bologna, Trieste and Sinigaglia (Senigallia). He appeared in many Donizetti operas, including Fausta, Anna Bolena, Parisina, Belisario, Lucia di Lammermoor and Roberto Devereux. Two of the greatest successes of his later career were as Masaniello in Auber's La muette de Portici and the title role in Mercadante's Il bravo. He retired in 1844." Elizabeth Forbes in Grove Music Online. 2 pp. Folio (ca. 260 x 205 mm). Dated Paris, October 6, 1827. In black ink on ivory paper. In Italian (with translation).Donzelli makes arrangements to pay off his father's debt. He also includes intriguing details about a legal matter involving the well-known impresario Domenico Barbaja and Giaochino Rossini. He sends regards to his correspondent's family, and notes that his wife, Jovina, will be giving birth soon. "As far as my father, I want you, as I have told you, to charge all the payments to him. You know very well that in Bergamo one can live comfortably on 4 lire a day. But no, he is not happy, he wants to be a nuisance to everybody; what annoys me most is that that includes you; I have gotten used to it. I am of the opinion that by giving up 40 lire a month and living economically in Milan with my mother-in-law, he can pay off his debts. I must also forewarn you that he cannot set foot in my mother-in-law's house until everything is settled, so that my mother-in- law can be sure that none of my father's creditors will come and bother him when he is with the family. "Our theater here has been let to a British company for 60 thousand a year. Barbaja was able to get much more; it's been a good deal for him, but he will regret it. I can assure you that Barbaja owes everything to Rossini, and to me if this sum counts, because the handwriting is so bad that all the lawyers are saying it did not happen that it was at most one quarter; that stays between us. The lawsuit he brought in Naples would be zero with everything that will have to be paid. Our theater will be open only 8 months of the year, and the other 4, they will be in London; a good arrangement in the interest of the impresario. Barbaja had to do anything to make money. "Creased and slightly soiled at folds; several small holes from oxidation of ink, affecting several letters; occasional light show-through, not affecting text. Faust I. Goethe`s Werke Achter Band (apart). Viaggio nel basso ed alto Egitto. Illustrato dietro alle tracce e ai disegni del Sig. Denon. Giuseppe Tofani,, Firenze, 1808 - 2 voll. In folio (mm. 580 x 400), mezza pergamena coeva con titolo su tassello in oro al dorso e piatti marezzati. Vol I: pagg. XI, (1), 214, una bianca, con la dettagliata spiegazione delle tavole. II volume II: raccoglie 151 magnifiche tavole (molte con piu figure) incise quasi tutte in acquatinta a piena o doppia pag. numerate A-G e 1-144. Le tavole sono il risultato di un lavoro eseguito da un'equipe di artisti italiani quali: Angelo Volpini, Francesco Inghirami, Giovanni Battista Cecchi, Giovanni Pacini, Giuseppe Pera e Luigi Sabatelli, su disegni e schizzi originali del Denon stesso. Le tavole raffigurano vedute, piante, ritratti, carte geografiche, planimetrie, particolari archeologici, costumi popolari.Prima edizione italiana di questo celebre racconto del viaggio compiuto dall'autore, il barone Dominique Vivant Denon (1747-1823), uomo politico e incisore francese, accompagnò Bonaparte in Egitto dove eseguì le illustrazioni di questa grande opera. (La prima, di Parigi, del 1802 è illustrata da 143 tavv.). Bell'esemplare con ampi margini su carta vergellata in barbe, solo lievi ossidazioni e tracce d'uso alla legatura. Note a lapis alla sguardia iniziale rimandano alla spiegazione della numerazione sempre a lapis, posta a lato delle tavv. che si riferisce all'edizione di Parigi del 1803. Dawson "Who was who in Egyptology", pag. 83: "He not only visited the Delta but travelled throughout Upper Egypt making a great collection of drawings and antiquities; he carried out his task of recording the Egyptian monuments very well, and also wrote an account of his journey. The "Voyage dans la Basse et la Haute Egypte" was issued in 1802 in 2 large fol. vols. and had a profound effect on European scholarship, running to several editions and being translated into English, German and Italian; Brunet II, 599 "ouvrage intéressant et d'une exécution soignée; il contient quelques notes et des augmentations qui sont dues à l'Abbé Fontana, alors bibliothécaire de la Ricardiana";Graesse II, 362:"ouvrage magnifique". L'A. il barone Dominique Vivant Denon (1747-1823), uomo politico e incisore francese, accompagnò Bonaparte in Egitto dove eseguì le illustrazioni di questa grande opera. ITINÉRAIRE DESCRIPTIF DE L'ESPAGNE, et Tableau élémentaire des différentes branches de l'administration et de l'industrie de ce royaume. (Cinq volumes avec les 29 cartes). Australia, Pacific - Mortier, Covens &Zn., 1808. RARE CHART OF THE WESTERN PACIFIC OCEAN "Carte Generale de la Polijnesie Australe ou des Iles Eparses de la Mer Pacifique... ". Copper engraving published in Amsterdam by Mortier, Covens & Zn. in 1808. Original hand colouring. Size: 44,5 x 60 cm.This map shows most of East Asia, Southeast Asia, Australia, and the south Pacific islands. Based on Johann Matthias Christoph Reinecke`s 1801 map of the region, which was the first German map to depict Tasmania as a separate island. There are few changes with the Mortier, Covens & sons edition, with the exception of the translation of many place names into French and Dutch.Australia is divided with the western portion named Nouvelle Hollande (New Holland) and the eastern portion named Nouveau Galles Meridionale ou Sijdnij Cove (New South Wales or Sydney Cove). Numerous place names fill the coasts of Australia, which is depicted with a hypothetical coastline stretching from Western Port to St. Peters Island. Dozens of tiny islands in the Pacific are named, including Hawaii (Iles Sandwich), which appears adjacent to the title cartouche. Several areas still show very early cartography, including Korea shown in a trapezoidal shape, and New Guinea with an elongated shape and a hypothetical northeastern coastline. Engraved by Willem Cornelius van Baarsel, who was only 17 at the time of publication.Price: â‚¬ 1.350,-. RYAKU GA EN: SIMPLE DRAWINGS BY KEISAI. [Edo 1808, Suharaya]. Orange stitched wrs., very good, minor. cover soil, contents clean, 18 x 26 cm., 30 double-folded. leaves = 60p. in all, 2 are text pages, 56 pages color wood-. block printed illustrations.COMPLETE IN 1 VOL. FIRST EDITION. A lovely book with a large number of color drawings and sketches. These lovely caricature drawings reflect the daily life of the Japanese engaged in all sorts of activities. Reminiscent of the Hokusai MANGA. Consisting of a large number of vivid and humorous sketches of Japanese life in the early 19th century. A delightful work ! Illustrated in tender pastel colors. * EDITION: This is the very rare and obscure true FIRST EDITION, published per the colophon in the back as Bunka 5th year  edition. Except for Dawes [see below], all of the other references below list this title as the 1823 date, a posthumous edition. . There seems to be a bit of a controversy regarding the actual title. While the front cover clearly shows the title to be RYAKU GA EN, other bibliographers cite an alternate titles KEISAI RYAKU GA EN, et al. per below references. It is one in the same book, but the later 1823 edition may use a variant title, causing confusion. *** REFERENCES: * L. Dawes: CATALOGUE OF JAPANESE ILLUSTRATED BOOKS,p.100 cites this exact 1808 edition, see 2nd from top entry. * C. Mitchell: THE ILLUSTRATED BOOKS OF THE NANGA, MARUYAMA, SHIJO AND OTHER RELATED SCHOOLS OF JAPAN: A Bibliography: p.453, 2nd entry from the top, cites artist's name as Kuwagata Keisai, an alternate "studio name" for Keisai. * K. Toda: THE RYERSON COLLECTION OF JAPANESE AND CHNESE ILLUSTRATED BOOKS: p.215 with title Keisai Ryakuga-en, see illustrations on pl210-213. * Harley H. Bartlett & Hide Shohara: JAPANESE BOTANY DURING THE PERIOD OF WOOD-BLOCK PRINTING: p.174, exhibit 58,illustrated as figure 48. He does not cite any date. Our copy does not have the same illustration as figure 48, so we believe that Bartlett was citing the later edition of the book. * Hayashi 1654 * Javal [I] 145 with title Keisai Ryakuga * Odin 118 with title Keisai Ryakuga * Roberts: DICTIONARY OF JAPANESE ARTISTS p.75 does solve this mystery by noting that one of Keisai's studio names is also Kitao Masayoshi, as per Chibbett. Keisai 1764-1824, was a pupil of Kitao Shigemasa a famous natural history painter of birds, flowers & animals. A skilful painter in the Kano style, who later retired to become a Buddhist monk. * NOT IN: H. Kerlen: CATALOGUE OF PRE-MEIJI JAPANESE BOOKS AND MAPS IN PUBLIC COLLECTIONS IN THE NETHERLANDS *** Color scans can be sent by email. Images displayed may not always be the exact photo of the copy in stock for sale at any given time. If you want to see the exact image of the book or edition in stock today, please request this by email. . Photos of most of our books are posted to our . London Printed for the Author and sold by W. H. Wyatt 1808. G : in Good condition. Some light rubbing to upper spine joint. Foxing and browning in parts with some offsetting. Inscription on fep First Edition Half leather marbled board cover 280mm x 210mm (11" x 8"). 8pp, 96pp, 2pp, 67pp, 1pp. Frontispiece portrait, 5 plates in first section [including 4 hand-coloured maps] 3 plates in second section [including one folding]. [Edo 1808, - Suharaya]. Orange stitched wrs., very good, minorcover soil, contents clean, 18 x 26 cm., 30 double-foldedleaves = 60p. in all, 2 are text pages, 56 pages color wood-block printed illustrations.COMPLETE IN 1 VOL. FIRST EDITION Color scans available for this book on request. Description content 2016Copyright Rare Oriental Books Co. Gesamtans., mit den Wasserfällen, "Veduta principale delle grandi e piecole Cascatelle di Tivoli, e loro adiacenze presa d' apresso la Villa d' Crazio .". - Kupferstich n. u. v. W. F. Gmelin, dat. 1808, 43 x 56,5 Fachgerecht restauriert und auf Japanpapier aufgezogen. - Sehr schönes Blatt. Grundsätze der höhern Kriegskunst und Beyspiele ihrer zweckmäßigen Anwendung für die General der Österreichischen Armee. Zoho kafu benran [trans. Textile Designs of India]. 27 full-page woodcuts (the first heightened in color). 24 folding leaves. 8vo, orig. wrappers (unimportant worming, mostly in gutter), orig. block printed title label on upper cover, new stitching. N.p. : 1808. Second edition, an abridgement of the author's earlier work which appeared in 1781 (an impossibly rare book). In the 17th and 18th centuries, there was an active trade between India and Japan, importing Indian "sarasa" chintz -- a highly glazed printed calico -- from the Coromandel coast to the island nation. 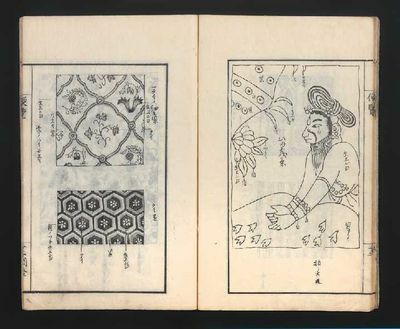 Manuals were produced in Japan with color directives to encourage Japanese textile printers to copy the Indian designs. 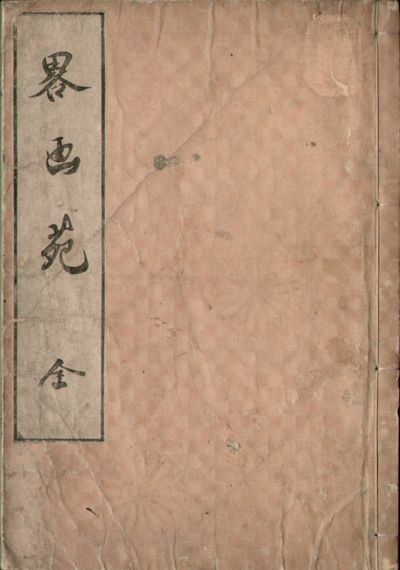 In this manual, the author describes the complicated technique in which colors are fixed on the surface of cotton with woodblock mordant stamping. Endless varieties of vegetable, animal, and mineral pigments were employed. The very attractive frontispiece depicts the textile designer planning a forthcoming design. He sits at a desk with pens, inks, and a blank sheet of fabric. Fine copy. .
Oepfingere Heiligen-Rechnung von Martini 1808 bis 10. November 1810. (Rechner). Rechnungs- und Inventarbuch von 1808. [Heiligenrechnungen der Pfarrkirche St. Martin zu Öpfingen über alle Einnahmen und Ausgaben an Geld] Rechnungen über Handwerksleistungen, Verkäufe, Einkäufe und Inventarlisten von alter Hand (zweifarbig) betreffend Kirche Sankt Martin oder Schloss Oepfingen? Hrsg: Freiherrn von Freyberg zu Öpfingen. Boucher de la Richarderie, Gilles. Bibliothèque universelle des voyages, ou notice complète et raisonnée de tous les voyages anciens et modernes dans les différentes parties du monde, publiés tant en langue français qu'en langues étrangères, classés par ordre de pays dans leur série chronologique; avec des extraits plus ou moins rapides des voyages les plus estimés de chaque pays, et de jugements motivés sur les Relations anciennes qui ont le plus de célébrité. 6 Vol. De Jordaan - P.J. Lutgers, 1857. BIJ ONS IN DE JORDAANGoudsbloemgracht gezien van de Lijnbaansgracht naar de Brouwersgracht. Sepiatekening van de hand van Petrus Josephus Lutgers (1808-1874), gesigneerd rechtsonder "P.J. Lutgers fec. 1857'. Afm. 26,6 x 36,1 cm.Door de geweldige bevolkingsgroei van het steeds welvarender Amsterdam en de sterke behoefte van de rijk geworden kooplieden om hun status te tonen, was vanaf het begin van de 17de eeuw een nieuw, ruim opgezet woongebied voor de elite nodig. Zo ontstond het plan om buiten de bestaande stadswal ten westen van het Singel te beginnen met de bouw van een heel nieuw woongebied met ongekend grote huizen langs brede grachten. Sinds 1613 werden de Heren-, Keizers- en Prinsengracht gebouwd, vanaf de Brouwersgracht tot de latere Leidsegracht. Later in de eeuw werd die strook uitgebreid tot een heuse grachtengordel. Een gebied met een exclusieve woonfunctie.Dat ging niet zomaar. De grachten werden niet gegraven op een leeg terrein. Het was een rommelige 'voorstad", met veel kleine bedrijfjes waarvoor in stad zelf de ruimte ontbrak en primitieve huisjes voor immigranten die geen huisvesting in de stad konden betalen. Die moesten wel ergens heen, besefte het stadsbestuur. Dat gold ook voor hinderlijke bedrijvigheid, zoals stinkende leerlooierijen en lawaaierige en brandgevaarlijke smederijen. Er was dus een nieuw gebied nodig voor dit soort activiteiten en 'uit te plaatsen" bewoners. Dat werd de Jordaan, tot dan toe het westelijkste deel van die voorstad.De Goudsbloemgracht ontstond toen vanaf 1612 vanuit de Brouwersgracht de grachtengordel in zuidelijke richting werd gegraven. Het werd een van de elf grachten van noord naar zuid. De bewoners en omwonenden noemden de Goudsbloemgracht het "Fransche Pad'. Het Fransche Pad lag al sinds de Middeleeuwen langs de sloot tussen de landerijen.Voor de nieuwe grote grachten had de stad veel geld over. Zo kon het hele daarvoor benodigde terrein (tot waar nu de Leidsegracht ligt) in korte tijd worden onteigend en vervolgens opgehoogd.Weinig geld was er toen nog maar over voor het restgebied dat óók binnen de nieuwe stadswallen moest komen. Hier onteigende het stadsbestuur dus alleen als het echt moest. Het oude sloten- en padenpatroon bleef globaal bestaan, al werden die sloten verbreed tot grachtjes en de paden tot straten. Ieder denkbaar ambacht mocht er worden uitgeoefend, zij het wel enigszins geclusterd.De wevers en ververs streken neer rond de Bloemstraat en Bloemgracht. Zij hadden veel belang bij schone lucht. Daarom werden de vervuilende zeemleerbereiders en leerlooiers verplicht zich een stuk zuidwaarts te vestigen, rond de Elandsgracht en Looiersgracht. De meeste pottenbakkers zaten aanvankelijk in de Rozenstraat en na omstreeks 1650 bij de Anjeliersgracht, die in 1863 Westerstraat zou worden. Het aan de Heren- en Keizersgracht geldende verbod om tussen de huizen stegen te maken naar achtererven, gold niet in de Jordaan en dat was te merken ook.De Jordaan verwerd tot een soort vergaarbak voor alles wat niet paste aan de deftige grachten. "In verschydene straaten vindt men veele huysen die van drie tot vier huysgesinne bewoond zyn', stelde een Jordaanbezoeker al in 1691 verbaasd vast. De buurt herbergde steeds meer immigranten, eerst uit de Zuidelijke Nederlanden, later uit Frankrijk, gevlucht voor geloofsvervolging en/of oorlogsellende. Toen eind 18de eeuw Napoleon de Nederlandse handel lamlegde, raakte de buurt pas echt overbevolkt en verpauperd. Steeds meer binnenterreinen werden volgebouwd, alleen nog bereikbaar door gangen van vaak nog geen meter breed.In de loop van de 19de eeuw waren er voor de grachtenbewoners steeds meer signalen dat de toestand in de Jordaan zwaar uit de hand liep, maar die werden verbijsterend lang genegeerd. God had de standen gewild. Kritische artsen waren de eersten die de noodklok luidden: het was vast geen toeval dat de cholera-epidemieën sinds 1836 vooral toesloegen in de Jordaan ? en die waren óók een gevaar voor de naburige elite!In 1852 verscheen een onrustbarend rapport over de toestand van kelder- en krotwoningen in Amsterdam. Nog datzelfde jaar richtten vooraanstaande grachtenbewoners de Vereeniging ten Behoeve der Arbeidersklasse op. In 1854 begon het bestuur met het aankopen van enkele percelen aan de Goudsbloemgracht en na de demping zou de nieuw ontstane Willemsstraat de trots van de vereniging worden.De praktijk bleek weerbarstig. Zelfs de model-Willemsstraters waren eigenwijs. Zo constateerde de politie in 1863 dat de koeienstal en mesthoop op het erf van Willemsstraat 174 een wel zeer hinderlijke stank verspreidden en in 1874 moest het toch echt een keer afgelopen zijn met het drogen van was over het hek van de openbare armenschool. De terugkerende berichtjes in de krant over huiselijk geweld, brandjes of bijvoorbeeld een hond die uit het raam werd gegooid, laten we dan nog maar buiten beschouwing.Prijs: â‚¬ 3.150,-. Carte Réduite de la Mediterranée et de la Mer Noire Dédié et Présentée a S.M. L' Empereur et Roi par P. Lapie Inr. Géoe. Cette Carte été Dressée l' aprés les déterminations Astronomiques les plus récentes sur les meilleures cartes marines et terrestres, remarques des Pilotes et journaux de navigation. Par J.A.B. Rizzi-Zannoni Géographe de Sa Majesté Sicilienne et P. Lapie Capitaine Ingénieur Géographe Francais. Rizzi-Zannoni & Lapie, Paris 1808 - Copper engraving, uncolored as published. Engraved by Pierre François Lapie. Printed from four plates, joint together. In excellent condition. 1808 1808 - under Commando af Premier-Lieutenant Wulf, giver - efter en levende Fegtning, fra Klokken 7, til 11 om Aftenen, d: 14de Martii, 1808, uden for Christiansand - en större engelsk Brig sit hele Lag af Canoner ret for ind, hvilket öjebliklig bevirkede dens Flugt. Den fiendlige Brigs Styrke: 22 cca 10 tt Canoner. Lougens Styrke: 18 18tt Canon. Akvatinte. 28,2x10,4 cm. [Total 32,2x42,1 cm.]. Let skjoldet. Mt. St. Gothard. (Mount Saint Gothard, Drawn and Etchid by J.M.W. Turner Esq. Engraved by Cha(rle)s Turner). London, C. Turner, 1808, - 17.5 x 26 cm (image), eau-forte, sépia, tirée du Liber Studiorum, 1 feuille (28.5 x 40.5 cm). Please notify before visiting to see a book. Prices are excl. VAT/TVA (only Switzerland) & postage. Paleis op de Dam - ets met aquatint, 1808-1825. Paleis op de Dam - "Vue du Palais Royal à Amsterdam"Ets en aquatint uitgegeven door J.L. van Bever tussen 1808-1825. Later met de hand gekleurd. Afm. : 49,5 x 76,5 cm.Gezicht op de Dam nadat de Waag is afgebroken, met Paleis en Nieuwe Kerk. Op de voorgrond veel activiteiten, zoals groentenverkoopsters, een schoenpoetser, wandelstokverkoper, een vertrekkende postkoets, een kruier. Links op de hoek met de toenmalige Beurssteeg een verkoopster van het Hoeden Magazijn die voor haar winkel klanten groet.Het waren magere jaren voor Amsterdam. De handel en scheepvaart in de Amsterdamse haven sterk afgenomen. De toegangsroutes waren verzand, er waren oorlogen met Frankrijk met Engeland en ook het embargo van Engelse producten op het Europese vaste land, had tot gevolg dat de ooit zo bloeiende haven bijna kon worden gesloten. Pas met de opening van het door koning Willem I geïnitieerde Noordhollandsch Kanaal in 1824 nam het scheepvaartverkeer van en naar Amsterdam weer toe en klimt de stad langzaam weer uit het dal.Prijs: â‚¬ 2.250,- (excl. lijst). ELEGANTE DAMES IN HET BOIS DE BOULOGNEMode tekening met pen en waterverf op karton door Jules David (1808 - Parijs - 1892). Gesigneerd links onder. Verso gedateerd/beschreven: "1877 / 3ème No d"Avril / No 16"'. Afmetingen: 29,1 x 23,5 cm.Het aquarel stamt uit een serie van modeontwerpen gemaakt door David voor het Parijse modetijdschrift Le Moniteur de la Mode ("Journal du Grand Monde. Modes, Illustrations, Patrons, Litterature, Beaux-Arts,Theatres"'). Hiervan bevinden zich verschillende exemplaren in het Musée des Arts Décoratifs (Pavillon de Marsan/Louvre). David was leerling van Duval le Camus en ontving van Le Salon in 1885 een Mention Honorable.Dit werk komt uit de verzameling van Charlotte von Prybram-Gladona.Charlotte, habituée van de Beau Monde, werd in 1910 geboren te München en trouwde op vierentwintigjarige leeftijd met de Weense edelman Albin von Prybram-Gladona. De echtelieden ontmoetten elkaar tijdens de danslessen die Albin, twintig jaar ouder dan Charlotte, nam om fit te blijven (!). Zijn familie onderhield nauwe banden met Einstein, Schweitzer, Rilke en Thomas Mann, terwijl hij Johannes Brahms kende als "onkel Jo".Toen Charlotte en Albin vlak voor het uitbreken van de Tweede Wereldoorlog verhuisden naar Parijs, verkochten zij noodgedwongen het leeuwendeel van hun meubelcollectie. Dat stelde hen echter wel in staat zich over te geven aan hun passie voor tekeningen, die beduidend minder plaats innamen. Het echtpaar keerde in 1969 terug naar Oostenrijk en vestigde zich in Salzburg. Albin overleed vijf jaar later, terwijl Charlotte er de hoge leeftijd van 92 bereikte.Prijs: â‚¬ 985,- (incl. 21% BTW). The Holy Bible, containing the Old and New Covenant, commonly called the Old and New Testament: Translated from the Greek. By Charles Thomson. Philadelphia: Pr. by Jane Aitken 8vo (22 cm; 8.5"). 4 vols. I:  ff. II:  ff. III:  ff. IV:  ff.. 1808 The first-ever translation into English of the Septuagint, the first English translation of the New Testament by an American, and the first Bible printed by an American woman — Jane Aitken. It was also the first translation of the Greek New Testament into English by a native of Ireland, and of course it is the work of a key figure of the American Revolution. Charles Thomson was born in County Derry, Ireland, 29 November 1729 and arrived with his brothers in the American colonies as an orphan in 1740, his mother having died before embarkation and his father having died at sea during the crossing. He studied ancient languages and theology; through the influence of Benjamin Franklin received the mastership of the Latin school in Philadelphia (now the William Penn Charter School); kept records of proceedings at the Treaty of Easton (1757) on behalf of the Indian tribes, and was adopted into the Delaware Indian nation; served as the secretary of every congress from 1774 until 1789; and designed the Great Seal of the United States. An abolitionist and ardent supporter of the Revolutionary cause, he was characterized by a fellow Revolutionary (John Adams) as “the Sam Adams of Philadelphia, the life of the cause of liberty,” and by a conservative (Joseph Galloway) as “one of the most violent of the Sons of Liberty in America.” It was he who informed George Washington of his election to the presidency. => On 4 July 1776 only two signatures were affixed to the unanimously adopted Declaration of Independence — those of John Hancock, president of the Congress, and Charles Thomson, secretary, in order to authenticate the document that had been voted on and approved. Yet by a curious twist of fate (read rather, surely, of a political enemy's knife), when the calligraphic copy that is so well known to every school child was ready shortly after 19 July, authenticator Thomson was not invited to sign it! 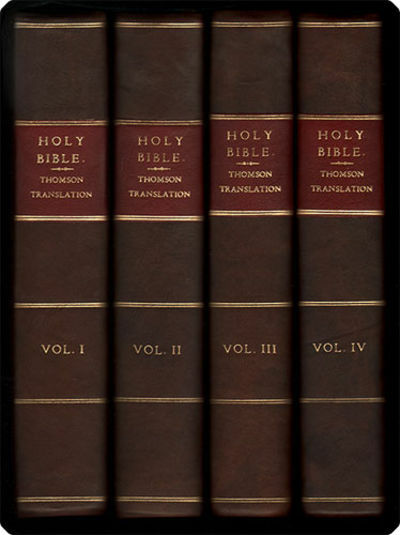 When he had retired from public life in 1789, Thomson was to turn his interest in the Bible and Greek to the 20-year task of producing this monumentally important work. Its printer was the daughter of Robert Aitken, who had printed the first Bible in English in America. A major edition of the English Bible, this is essential for any Bible collection, not just for collections of American Bibles — though as an American Bible and simple Americanum it has a revered place. Provenance: 19th-century signatures of D. Shields and of John K. Wilson in ink and pencil on title-pages, one of Wilson's signatures dated 1871. Recent quarter brown calf with stone-pattern marbled paper sides; a lightly tanned set with occasional light spotting only. => A solid and very good set. Exposicion de los hechos y maquinaciones que han preparado la usurpacion de la corona de España, y los medios que el Emperor de los Franceses ha puesto en obra para realizarla. Mallorca: En la imprenta de Melchor Guasp 4to (19.5 cm, 7.625"). 60 pp.. 1808 [bound with] Cevallos, Pedro de. Política peculiar de Buonaparte en quanto a la religion católica.... Palma[, Mallorca]: En la imprenta de Brusi, 1812. 4to. 48 pp. 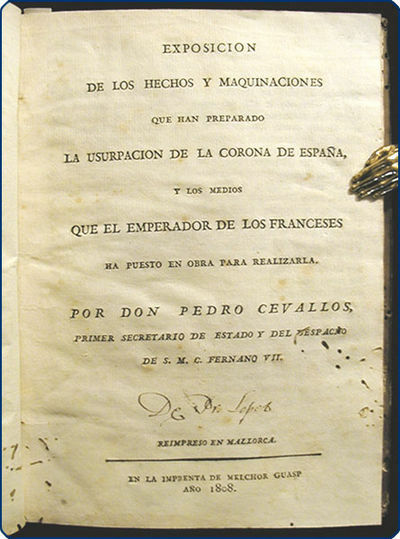 Two significant Mallorcan imprints of the Napoleonic wars by Pedro Cevallos (1764–1840). The Exposicion details the perfidy of Napoleon in Spain, in particular his luring of Ferdinand VII away from Madrid and the placing of Joseph Bonaparte on the throne. This piece proved an effective piece of anti-French propaganda, was widely published, and was translated into Portuguese, English, German, and French. In the Politica peculiar Cevallos reveals Napoleon's attitude toward the Church, and his desire, if he could not absolutely destroy Catholicism, at least to bring it under thorough state subjection. Both of these editions were issued in Mallorca and they are rare: Via NUC Pre-1956 and WorldCat, we trace only one copy of the Exposicion and three of Politica in the U.S. Contemporary acid-stained calf simply gilt with brown leather label on each spine; scattered wormholes and some loss of leather over corners and at base of spine. Endpapers stencilled red and green. Some interior worming, most noticeable in endpapers and first title-page, resulting in loss of parts of letters without loss of sense. Scattered light foxing and a few leaves shallowly dog-eared. Inked ownership inscription on title-pages. All edges speckled red.